“Pancakes! Pancakes! Pancakes!” My stomach has been chanting this all week long! I had every intention of a Sunday Pancake breakfast. My tummy had other plans. After work last night, I ate a slice of pizza. I do not think this settled well with me, as I woke up at 6 am feeling nauseous. After dragging myself out of bed this morning, I made some lemon ginger tea. ( Ginger is good for the stomach, ya know). I had even a hard time swallowing that. I blame myself for this one… I really shouldn’t have eaten something like that before heading to bed. I left to go to the hospital to get information on my patients for clinical this week. By the time I left the hospital, I started to feel like I was ready to get something in my stomach. 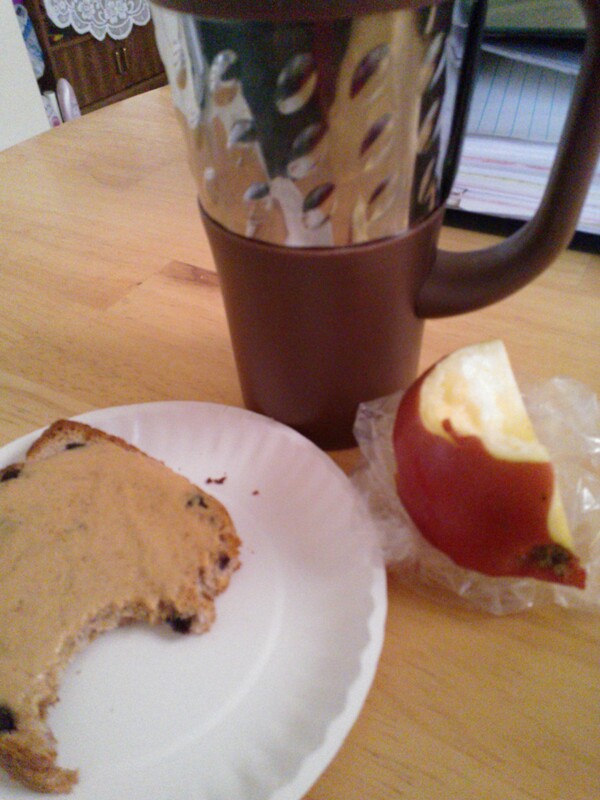 I took it easy with a toasted slice of Sara Lee Blueberry Crumble Bread and some PB2, alone with a bit of a Jazz apple. Have you ever heard of a Jazz apple. It reminded me of a Gala Apple, but with a bit more crunch. My absolute favorite apples, though, are Fuji and Honey Crisp! After a day of snacking on bread, my stomach started feeling a bit better. I made the dinner I had planned for tonight with the hopes it would settle well. Dinner was in the breakfast form of an egg white omelet stuffed with avocado, red bell pepper, onion, tomato, and shredded fat free cheddar. 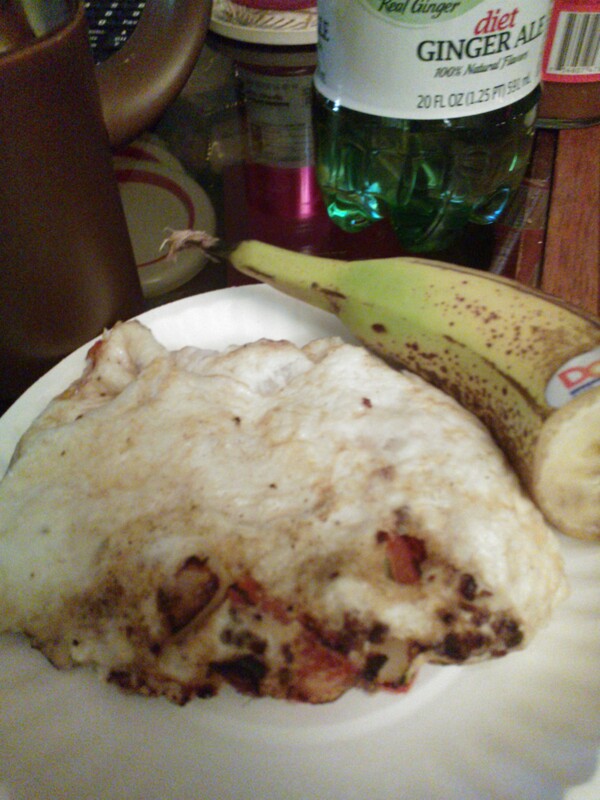 This was super yummy and I ate it with half a banana with the intent to fill myself with some nutrients. This picture does not look very attractive but its good! When I visited Meaghen in NYC, I stopped by a cafe and the woman in front of me ordered this in a burrito. I got the same and did not regret it! Things were feeling good, but as the night progressed, the stomach aches got worse. Theres been a bug going around these parts, and I’m convinced it was a combo of that and the pizza, that my body is not accustomed to eating. My parents are funny.. they started having sympathy pains for me! I’m praying for a recovery for clinical in the morning.